Chicken ITle and I have had it up to here with those who see people and society as a passive bus-load of zombies trundling towards whatever dreadful fate they are frothing up today, whether it be rising oceans or robots doing us out of a job. We aren't helpless and we aren't mindless. We adjust, we respond, we correct, we react - as individuals and as communities and societies. The only thing mindless is the use of extrapolation to predict the future. We should do better than that. I blogged before about robotic doom-mongering. Now my old mate Chris Dancy is at it: apparently a robot is waiting for your job. Well, I *think* he is doom-mongering. I wonder if Chris's tongue is in his cheek: (a) he's smarter than to think we can replace knowledge workers with machines in 7 years and (b) I can't see him falling for vendor hype like Watson. 10 years ago I was peddling a self-learning neural network product as the cure to all ills. That particular snake oil sank into obscurity without ever making the transformations promised. Watson is no better. IBM have to recover some of that R&D, and they have to brand as innovators. So too do a small number of clients with more money than sense. Watson will disappear too, after they've generated a few brochure case studies. Remember Big Blue? I'm no expert on AI, but I know enough to know Watson is just a fancy IVR answer-phone. Sure it can learn the answers you like to hear, pulling them from known data. But it does not truly understand. It has no experience, no context. It no more understands WHAT it is answering than your IVR does. John Brand at Forrester has similar things to say about Watson. Stop anthropomorphising a dumb machine. Apply my Standard+Case model: Watson can pull a standard answer from a knowledgebase if it thinks it has a match, just as if it were playing Jeopardy. But it can't reason enough to perform any but the simplest diagnoses. It can't develop hunches. It can't work out that you are lying through your bloody teeth when you insist you didn't change anything. it will never be a case worker. And even if they assemble enough logic engines and voice recognition and other technologies to build a super-machine that gets diagnosis right maybe half as often as a human, that only helps in the Simple domain. 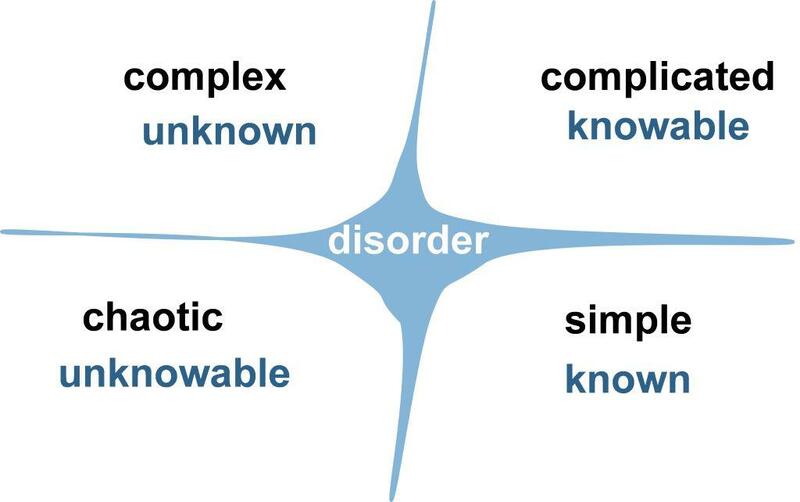 Look at the Cynefin model: there are four domains that situations can fall into and Watson is stuck in the Simple one. So it's no different to the factory: if your job involves mindless drudgery then maybe Watson the robot can do it more reliably and cheaply. But if you are replace-able that's because you are doing a robot job - get out of it. If your job is to be a real human and a knowledge-worker then relax, your job isn't going to a robot. An Indian, Filipino, or Nigerian maybe, but not a machine. If a robot replaces someone now or in the foreseeable future (based on real facts not wild extrapolations) it is because that person was doing a job I wouldnt wish on them. If you free people from slavery, they find new things to do. History has shown that over and over. We should embrace their liberation, not set them quaking in fear. Forget all the sci-fi your brains have been addled with. Current real-world robots are dedicated machines that can do one task better than a human can, over and over. They're not general thinking machines, not even Watson. AI is still so far away it's ridiculous. Artificial intelligence is like nuclear fusion: it has been 10 years off for the last fifty years. And McKinsey predict it will stay that way: the future of robotics will continue to be dedicated to specialised tasks. So what happens when robots take more and more drudge jobs? Same as has been happening for the last 30 years as robotics expanded. People find new jobs. Entrepreneurs work out how to use available talent to deliver value. We are resilient, resourceful, intelligent. We turn situations to our advantage. We find new opportunities. Heck, we CREATE and INVENT new opportunities. We legislate against negative effects (when we're smart enough). Seven years ago there was no smart phone. There is nothing fundamental in that smartphone that didn't exist thirty years ago. It is a radio and a computer. It didn't take seven years to happen: it took a hundred or more. Continual refinement of communications and computing led to the smart-phone. Sure technology is happening in a rush, but there are limits (the chessboard fallacy). Limits to technology's advances but more importantly limits to the human and social capacity to adopt them. I'm not anti-robots, and I'm not a pessimist. I'm a rational optimist. I embrace the advance of technology. I know it is happening at a far more manageable pace than the pundits would have us believe. My only regret is that I think science will stop the aging process just too late to allow me to see all the wonderful things to come in our future ... with the robots. Unemployment has been up and down lately, but that has everything to do with pillaging thieves in the 1%; and ruthless suppression of under-classes in Europe and especially the USA; and nothing to do with robotics. The robots aren't a threat; they're a liberation from drudgery and a cool toy with it. Chicken ITle says get over it and worry about a real threat, such as that under-class.